It almost went unnoticed. Apple earlier this year announced that their newest store will not be called a store, but rather a “town square”. Traditionally a place where people exchange ideas, goods, argue, fall in love or just hang out, the town square has an important social role to play in public life. The ancient Greeks had the Agora, considered one of the building blocks of a stable and happy society. The literal meaning of the word is “gathering place” or “open place of assembly” and it was the centre of athletic, artistic, spiritual and political life – a place for exchange, a market place for slaves, for craftsmen and their goods, but also for ideas and announcements pertaining to civic life. The Apple “town square” boasts that it no longer has aisles, but “avenues”. Where we can presumably wander enslaved to digitalisation. What does this mean for freedom and independence of public space? And will other commercial enterprises follow suit? In an increasingly urbanised landscape, public spaces are already said to be threatened in many European cities. The struggle to balance public and private spaces is increasing as the price of land rises, and as average household living space shrinks, public space becomes ever more important. A town square should not by definition be trademarked, commercialised nor quantified. A good town square lies at the heart of a lively, liveable city, of a functioning democracy, and creates a sense of community. If stores such as Apple try to take over the role of public space it means our choice becomes limited and above all compromised. Apple seem to believe that they are creating new communities by offering classes in coding, music and photography, and by creating a space where people want to hang out. But this misses the point of what a town square really is at its heart – a free public space independent of commercial activity. Making public space indoor space is one of the new ideas that is being touted for providing a modern day Agora. With the exception of railway stations, public space is generally seen as outdoor space. Kjetil Trædal Thorsen a partner of Snohetta architects suggests that “in the layered systems of our cities of the future, we will need to focus on the public spaces that are found inside buildings— and make them accessible.“ However keeping them free of a dominant commercial enterprise is a challenge for planners. 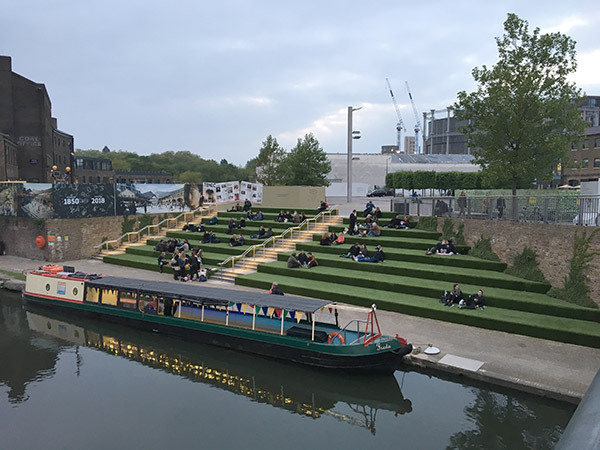 Whether an indoor or an outdoor Agora, another of the problems that planners are facing in cities today is the non-differentiation of space – that is homogenised areas taking over public space – by means of over- or even under-gentrification. For the Agora principle to work we need diversity in public space – in ideas, goods, services and last but not least, people. The new Kings Cross development in London is a good example of public private partnership with well developed and carefully considered public space. Not so long ago it had a reputation as a red light and druggie district, and was typical for an area around major transport hubs. Today it is one of the most sought after living areas of central London, and a buzzing lively public space (even when raining). The sensitive development of this historical canal and transportation district has seen the building of two schools, a university, 2,000 new homes (of which 50% are affordable), a swimming pool, jobs, a cookery school, a mobile community garden grown in skips, floodlit sports pitch, 20 restored historic buildings, and most importantly of all the creation of 26 acres of open space, with fountains and trees, and places alongside the historical canal to sit or freely wander. Another threat to the whole need of and notion of public spaces is the rise of the co-working spaces. Places such as “WeWork” are the new third places claiming to replace some of the key functions of public life and town squares. In a recent interview in the Guardian newspaper, Eugen Miropolski, a WeWork executive, was quoted as saying that, whereas in the past, “the residents of urban areas were brought together in part through town halls, gatherings in taverns, cafes and open spaces to hash out the subjects of the day.” WeWork he says, aspires to be “a place where people can come together, talk, discuss new ideas, and innovate in a collaborative way”. He concludes that, “real estate is just the platform for our community”. WeWork is, one could say, a form of company town, providing the town square in the guise of an enclosed member based space. As writer Evgeny Morozov critically points out, “In WeWork’s future, the hastily privatised public space is returned to citizens. However, it comes back as a commercial service provided by a lavishly funded data company, not as a right” . The workers, he goes on to point out, have discovered that the workplaces have colonised their non-work lives. ← Is our definition of HOME evolving?